(Phys.org) —A study conducted by Alberto Salvo and Franz Geiger of the National University of Singapore and Northwestern University respectively, has revealed that when drivers switch from using ethanol to power their vehicles, to gasoline, ozone levels in the local atmosphere may drop. They offer details of their study in their paper published in the journal Nature Geoscience. Sasha Madronich of the U.S. National Center for Atmospheric Research offers a News & Views perspective on the duos work in the same journal issue. Ethanol—fuel derived mainly from plants—has been touted for several years as a much cleaner alternative to gasoline. When burned, ethanol doesn't emit as much particulates or carbon monoxide, and more importantly perhaps, hydrocarbons such as CO2. But now it turns out, it may have a previously unknown downside as Salvo and Geiger have discovered burning ethanol in cars can cause higher levels of ozone to come about in the local atmosphere than does burning regular gasoline. Ozone comes about in the atmosphere due to interactions between volatile organic materials along with nitrogen oxides and sunlight. Combustion engines don't produce ozone, but their emissions can lead to other interactions that do, thus it's far more difficult to determine what impact vehicular traffic has in the generation of ozone, than it is to measure other pollutants such as carbon monoxide. This latest study actually came about partly by accident—the cost to consumers of ethanol began rising in São Paulo to the point that drivers soon began turning back to gasoline (Brazil is major producer of sugar cane produced ethanol). Coincidently, the city also maintains air pollution monitors throughout the area. To learn of the change in air quality, the researchers simply analyzed air pollution levels for the years 2009 through 2011—a period of steep price increases for ethanol. They were surprised to learn that moving back to gasoline, which did result in higher levels of carbon monoxide and nitrogen oxides along with hydrocarbons, also caused lower levels of ozone. They suggest this happens because ozone chemistry in São Paulo is restrained by high concentrations of nitrogen oxides and also the limited availability of volatile organic compounds. Thus, it appears the phenomenon they observed, might be unique to the area. Madronich isn't as sure, suggesting that the results of the study in Brazil might be applicable in other places and perhaps should even serve as a "gold standard" for studying the impact of different types of fuel used in vehicles on air pollution. Prior studies she notes, have been limited to the lab, or by a lack of real world opportunities. Ethanol-based vehicles are thought to generate less pollution than gasoline-based vehicles, because ethanol emissions contain lower concentrations of mono-nitrogen oxides than those from gasoline emissions. However, the predicted effect of various gasoline/ethanol blends on the concentration of atmospheric pollutants such as ozone varies between model and laboratory studies, including those that seek to simulate the same environmental conditions. Here, we report the consequences of a real-world shift in fuel use in the subtropical megacity of São Paulo, Brazil, brought on by large-scale fluctuations in the price of ethanol relative to gasoline between 2009 and 2011. We use highly spatially and temporally resolved observations of road traffic levels, meteorology and pollutant concentrations, together with a consumer demand model, to show that ambient ozone concentrations fell by about 20% as the share of bi-fuel vehicles burning gasoline rose from 14 to 76%. In contrast, nitric oxide and carbon monoxide concentrations increased. 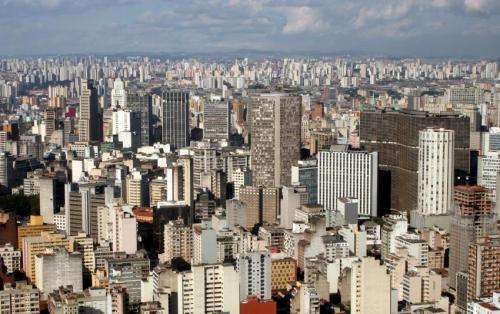 We caution that although gasoline use seems to lower ozone levels in the São Paulo metropolitan area relative to ethanol use, strategies to reduce ozone pollution require knowledge of the local chemistry and consideration of other pollutants, particularly fine particles.